Photo: I purchased an iPad 2 for my parents last month—I even had my husband stand in line for it. We took it with us when we traveled across the country to visit them, but we left the box at our house. Now Stella likes to slide it along the floor as she crawls. In the mean time, check out her first encounter with the iPad 2 at the airport using the PopOut! The Tale of Peter Rabbit app. 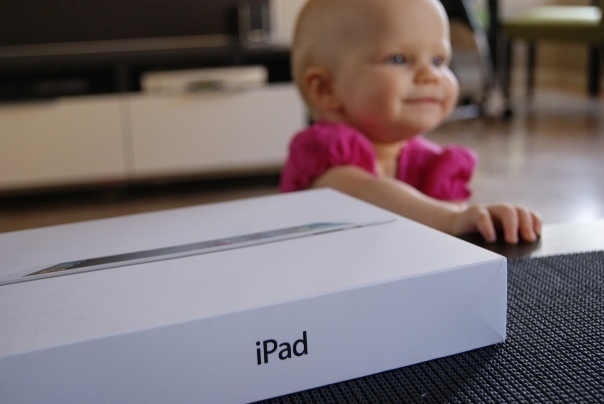 Posted on April 30, 2011, in 11 months, photo, video and tagged 11 months, baby, book, box, digital, iPad, iPad 2, Peter Rabbit, Stella, video. Bookmark the permalink. 1 Comment. This is really cool. What a cool way to share all the neat things about Stella’s growth and the family!